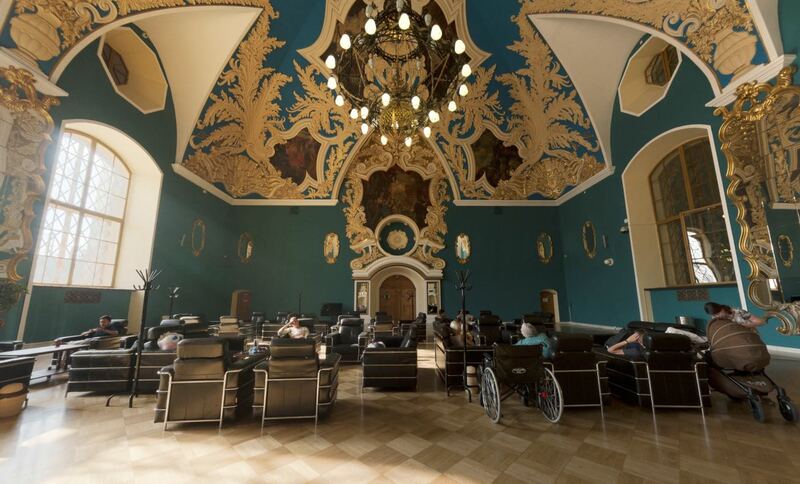 In this article, I will explain you the services offered by Russian train stations, such as baggage storage, free Wi-Fi, services for people with disabilities, ATMs, shops or the VIP lounge. 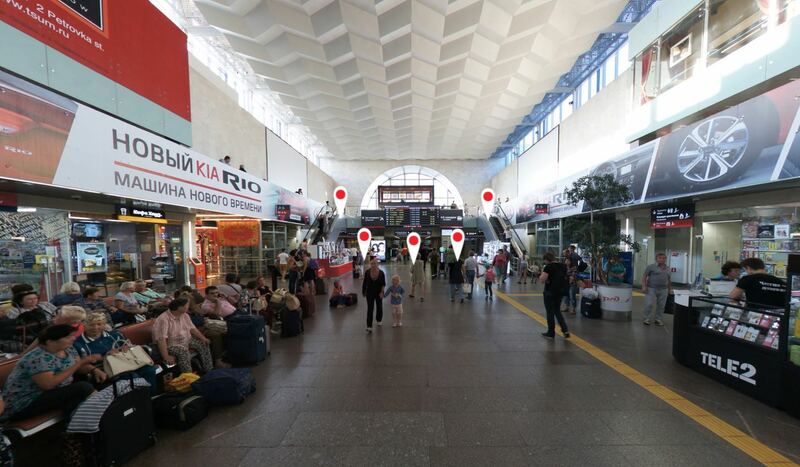 RZD, the national railways company of Russia, currently manages a total of 353 railway stations throughout Russia (in the annex you can find a link to the official website of each of these stations), with an annual passenger traffic of around 340 million people. Do they have luggage rooms? Do they have Wi-Fi service? Can I buy a Russian SIM card at the station? Do they have ATMs to withdraw money? Do they have a taxi service? Are they accessible to people with disabilities? Train stations in Moscow, St. Petersburg or other large Russian cities, usually offer various services: left luggage facilities, free WIFI, ATMs, shops, public toilets (usually paid), information services, services for people with disabilities, taxi service, parking for vehicles, etc. 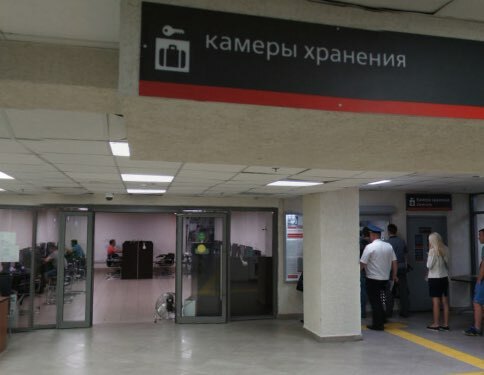 Call any of the RZD information toll-free numbers, which also offer customer service in English: 8 (800) 775-00-00 (general information) and 8 (800) 510-11-11 (help center to provide mobility for people with disabilities). The first operator that will answer you will do it in Russian, so you have to be kind enough to say in English that you don’t speak Russian so he/she can attend you in English, or communicate you with an operator who speaks it. 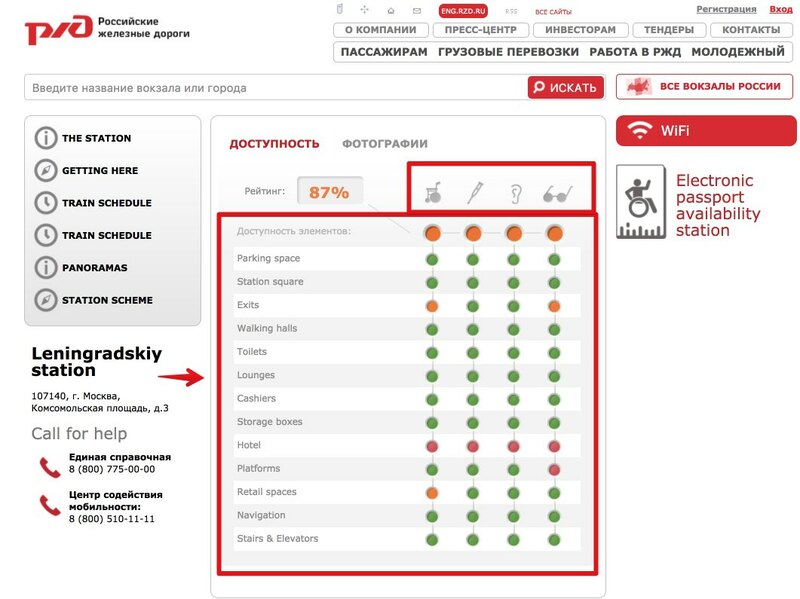 Access the official website of Russian Railways (RZD). 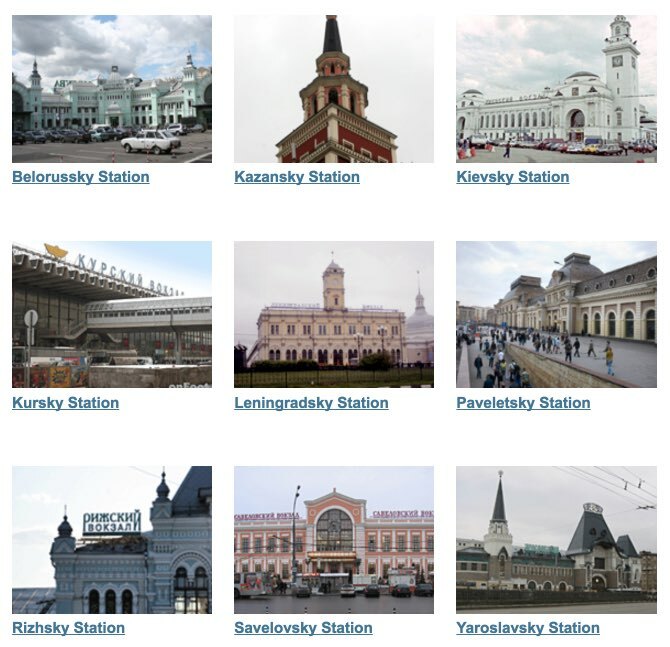 In RZD’s official website you can consult the list of all Russian railway stations websites; however, this list is in Russian and with links to the Russian version. 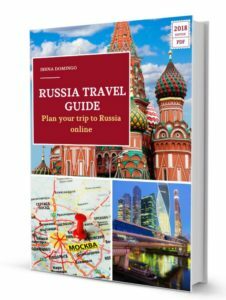 For this reason, in the annex to this article I include a link to the English version of the official website of each of the train stations in Russia. Let’s see an example. 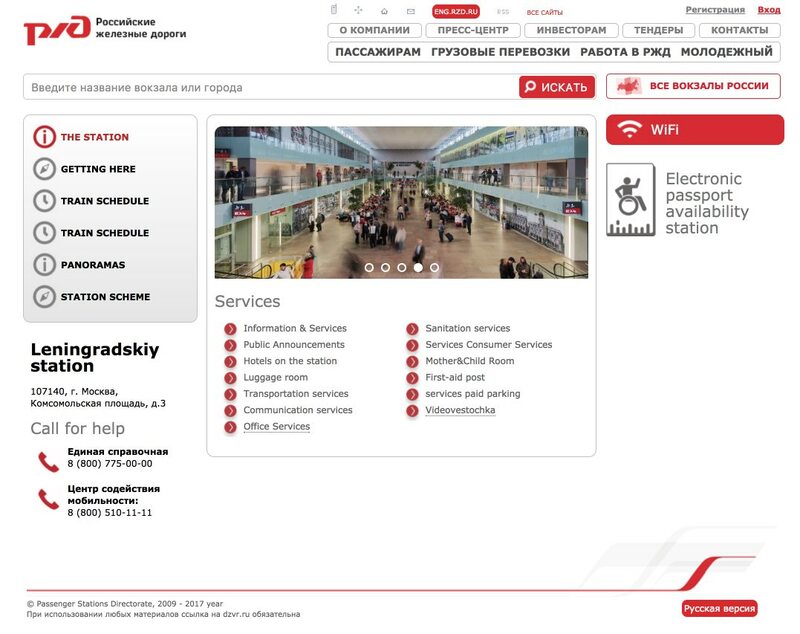 If you want to know the services offered by Leningradsky station in Moscow, you will have to access the RZD website of this station (in English): http://leningradsky.dzvr.ru/en/. The stations in which “Luggage room” is specified offer a luggage storage service. If you arrive early to the city and you can’t check in at the hotel until later, or you just want to visit a city during the day and then continue your train journey without staying (as it can happen in any of the stops on the Trans-Siberian route), a good option for not having to carry suitcases is to leave them at the train station luggage storage. 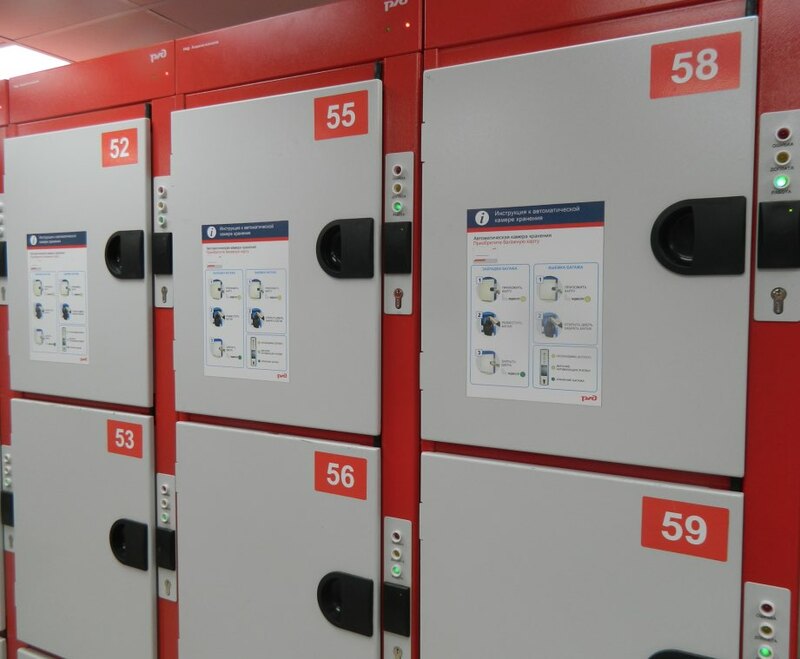 Manual luggage storage, attended by staff, in which they will scan your bags, they will ask for your passport and they will give you a receipt with which you will have to return to pick them up. The cost is about 180 rubles per package per day. Automatic luggage locker, in which you must also present your passport at the entrance and follow the instructions to deposit your luggage. These storage premises are usually a little more expensive, depending on locker size and the period of time you use (between 250 and 500 rubles a day). Although train station storage deposits are safe, it is advisable not to leave any valuables in them (jewelry, documents, credit cards or electronic equipment of value). It is also important to know that on RZD trains, each ticket entitles you to carry a hand luggage up to 36 kilos (or 50 kilos if you are travelling in a compartment with bunk beds). The volumetric weight of carry-on baggage must not exceed 180 cm. You can also store baby strollers or bicycles, as long as they are folded or in their packaging. Most stations have free wifi. You just have to check if they come with the WIFI sign. 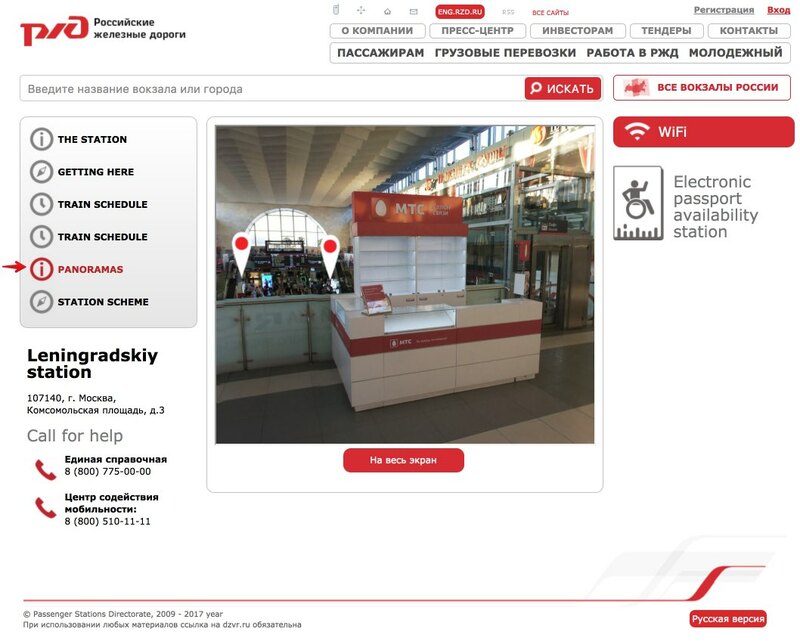 If there is no Wifi sign in the station or if you want to be permanently connected to the Internet during your trip in Russia, in many stations you can buy a Russian SIM card. These SIM cards can be bought in stores or in small mobile phone kiosks of the stations. To know the services offered in each station for the disabled, you must click on the “Electronic passport availability station” section. You will see which adapted station services are available for people in wheelchairs, people with mobility difficulties, people with hearing impairment or blind people. If you buy a train ticket from Moscow to St. Petersburg, the departure station that will probably appear on the ticket will be the Oktyabrsky station in Moscow, a name previously held by this station, now called Leningradsky. The arrival station in St. Petersburg is Moskovsky. On the attached map you have the location of Moscow train stations, along with the nearest Metro station. 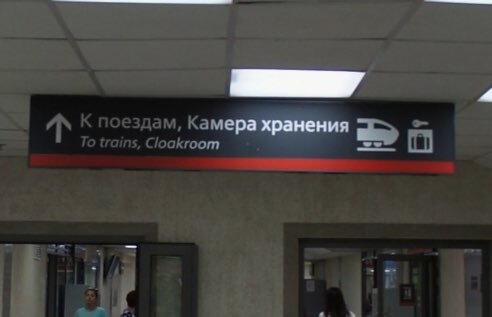 There are three stations that are close to the Komsomolskaya Metro station, that are not to be confused: Leningradsky (from where the trains depart in the direction of St. Petersburg, northwest Russia, Estonia and Finland), Kazansky (trains to Central Asia, Ryazan, Ufa, Samara and Novorossiysk) and Yaroslavsky (trains to Siberia, Far East of Russia, Mongolia and China).